Or does it? Nobby and I are going to Lee Valley Youth Hostel next week to check it and the surrounding area out in preparation for the Youth Hostel Weekend in April. We’re letting the train take the strain which will mean arriving at Paddington and departing from Liverpool Street. Usually I would ride across London to make the connection, however, I came across a new tube map yesterday which offers the possibility of a successful trip below the streets of the capital. 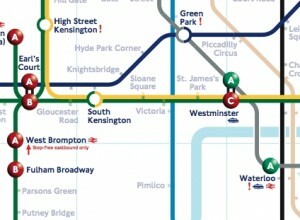 The Step Free Tube Guide Map is a tad complex, but then so is trying to get around in its network of stations. It sets out to convey where there is step free access between the street and the platform, and between lines, as well as the worst case gap and step height between the platform and train. So, starting at Paddington, the map suggests that there is step free access between the Circle and District lines but not from street to platform, which is confirmed in the station notes “on the back”. Now, returning from the Limbless Association’s AGM in December, I popped down in the lift at Paddington to have a nose around and I spoke to one of the ticket inspectors who said I could get to platform step free heading in one direction. I wonder if Jim or Dave could enlighten us on the actual layout? Assuming we can get to the platform and we get on the east bound train on the Circle line we then zip along to Edgeware Road which is represented by two tricolour circles. A look at the station notes explains that we might need to change to continue our journey but if we do there are no steps. We should then zip along to Liverpool Street where, because we’re traveling easbound, we should be able to exit the underground and rendezvous with a well earned coffee and chocolate brownie. I can’t imagine ever getting a trike through the underground – although I’m happy to be proved wrong – but the Brompton shouldn’t be an issue as long I can get away with pushing it (avec prosthesis) or scooting it (sans prosthesis) to the platform. Happily though that shouldn’t be an issue, because a quick glance at the Bicycles on the Underground Map shows that bikes are in fact allowed on the tube between Paddington and Liverpool Street, rush hour aside. So there we have it, dependent on getting the situation with regard to the lift at Paddington clarified, we should be able to make the connection using the Tube. Whether we’ll choose to do it that way ever again we’ll see, but at least we’ll have the choice. This entry was posted in Inclusive Cycling Forum and tagged bikes, disability, london, maps, mobility, rail, words on Thu 25 Feb 2010 by kevin hickman.